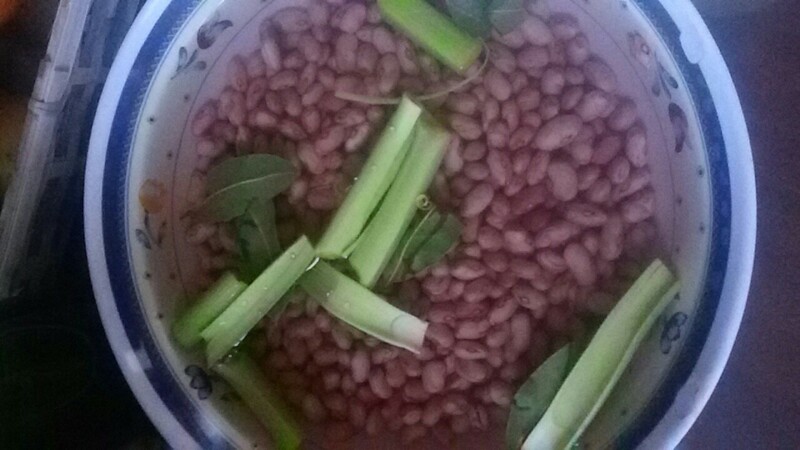 I would like to know the purpose of large spring onions and bay leaves and baking soda when soaking beans overnight as in the following picture. Is it for cleaning the beans, killing germs, easing in on the smell, or adding flavoring? What other sort of seasoning can be added when soaking beans eight hours overnight prior to cooking? The spring onions and bay leaves honestly seem like a waste. Usually you discard the soaking water, and that's going to take most of the already-subtle flavor with it. So if you want to add flavor, whether with spring onions and bay leaves, spices, or anything else, add it during cooking. The cooking time is plenty long to get all the flavor into the water/broth and beans, and you won't be pouring any of it down the drain. Baking soda is added during soaking mainly to help soften the beans faster. People will also say it helps reduce gas-causing sugars, and perhaps other reasons, but it's hard to find evidence for them. Relatedly, many people add salt during soaking to help soften and avoid bursting. Not the answer you're looking for? Browse other questions tagged flavor beans or ask your own question.